This soft grain finish zippered travel wallet makes the ideal travel companion. 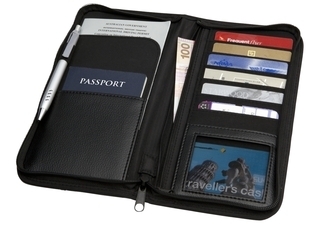 Features include a passport pocket, multiple card pockets, ticket flap, security compartment with zip and pen loop. Your logo can be printed onto the wallet or engraved on the brushed chrome accent plate. Pen additional.